Married Name 13 August 1983 As of 13 August 1983,her married name was Solbue. Lois J. Moehlmann was born on 12 April 1945 at Iowa. She died on 9 February 2015 at age 69 Lois J. Solbue was born April 12, 1945 in Sioux County, Iowa to Edith Moehlmann. She died February 9, 2015 at Sanford hospital in Sioux Falls at the age of 69 years, nine months and 27 days. Lois was raised by her grandparents, Mr. and Mrs. George Moehlmann, near Chatsworth, Iowa where she attended school. She was baptized and confirmed at St. Matthews Lutheran Church in Chatsworth. Lois graduated from Hawarden High School and started working at Otis Radio in Hawarden. She married Loren Solbue August 13, 1983 at Nathanael Lutheran Church in Alcester. They made their home in Alcester and Lois continued to work at Otis, later becoming Coil Craft, where she worked a total of 43 years. She retired seven years ago. She was an avid reader, active at Nathanael Lutheran Church and volunteered her time at Dakota Diner in Alcester. Survivors include her husband of 31 years, Loren Solbue of Alcester; her mother, Edith Moehlmann Packard of Hawarden, IA; her mother-in-law, Lillian Solbue of Alcester; her aunt, Eileen Moehlmann of Hawarden and two cousins. She was preceded in death by her grandparents, her father-in-law, Judin Solbue and her uncle and aunt, Albert and Violet Moehlmann. Funeral services will be 2PM Friday, February 13, 2015 at Nathanael Lutheran Church in Alcester. The family will be present to greet friends 5-7PM Thursday at the church followed by a prayer service at 7PM. Albert Moehlmann was the son of George Moehlmann. Albert Moehlmann married Violet (?). Albert Moehlmann died before 2015. Married Name Her married name was Moehlmann. Violet (?) married Albert Moehlmann, son of George Moehlmann. Violet (?) died before 2015. Rodney Hanson was the son of Lars Hanson and Alma Anderson. Rodney Hanson died before 2006. Darrell Hanson was the son of Lars Hanson and Alma Anderson. Darrell Hanson died before 2006. Paul Buum was born on 18 August 1962 at South Dakota. He was the son of Owen Buum. 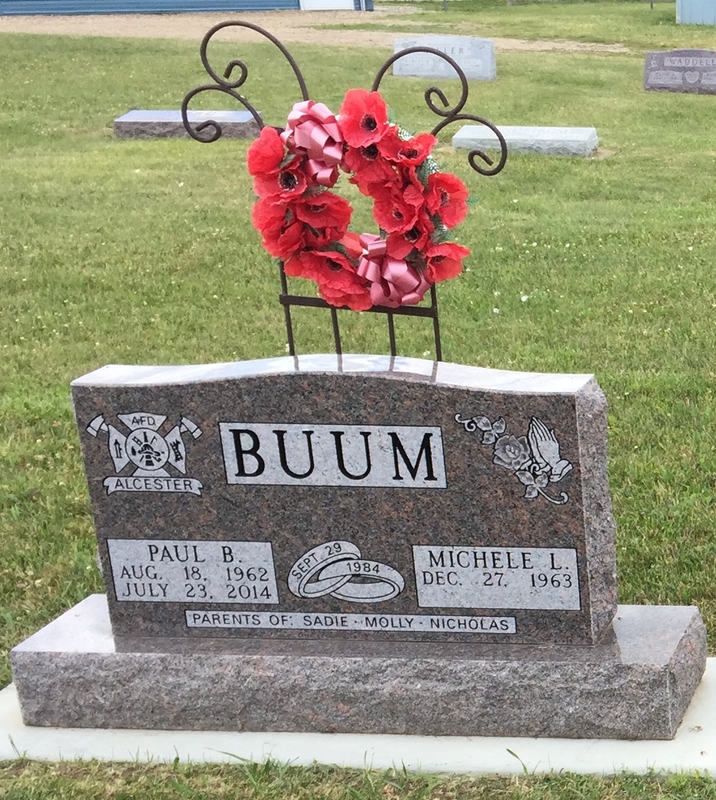 Paul Buum died on 23 July 2014 at South Dakota at age 51 Paul Buum was born August 18, 1962 in Hudson, SD to parents Owen and Adele (Johnson) Buum. He died July 23, 2014 at Sanford Hospital in Sioux Falls, SD at the age of 51 years, 11 months and 5 days. Paul graduated from Alcester High School in 1980, attended USD for one year, and finished his schooling at Southeast Technical School. He worked at the Printing Center and Deals on Wheels in Sioux Falls and has owned and operated the Alcester Union/Hudsonite newspaper since 1997. Paul married Michele DeReu on September 29, 1984. They moved to Alcester in 1989 where he resided until the present time. Paul was a lifelong, active member of the Alcester United Church of Christ, serving in many roles. He also served on the Alcester City Council and Housing Commission, Alcester Golf Course Board, South Dakota Newspaper Association Board of Directors, and was a youth baseball coach. He was a dedicated member of the Alcester Fire Department and a former chief, believing strongly in their commitment to protect the community. He enjoyed golfing and woodworking. He was artistic and creative. Every close member of his family has a keepsake crafted by his hands. Paul's greatest love in life was his family, especially his children and his precious granddaughter Amelia. He was preceded in death by his father Owen Buum; paternal grandparents and his maternal grandfather. He is survived by his wife Michele Buum, Brookings; three children, Sadie (Nathan) Bossert, Aberdeen, Molly Buum, Vermillion, and Nicholas Buum, Brookings; granddaughter Amelia Bossert; mother Adele Buum, Brookings; grandmother Olive Johnson, Alcester; brother Dan (Vicki) Buum, Sioux Falls; sister Katherine (Craig) Treiber, Brookings; and many other nieces, nephews, relatives and friends. Funeral services will be 10:00 AM, Monday, July 28, 2014 at the Alcester United Church of Christ with burial to follow at Pleasant Hill Cemetery, Alcester. Visitation will be Sunday at the church from 3PM to 5PM with a prayer service at 5PM. Donations may be directed to the Alcester Fire Department. He was buried after 23 July 2014 at Pleasant Hill Cemetery, Alcester, Union, South Dakota. (?) Johnson died before 2014. Ludwig Larson married Oliva Stone. Oliva Stone married Ludwig Larson. Married Name Her married name was Megard. Stella Larson was the daughter of Ludwig Larson and Oliva Stone. Stella Larson married (?) Megard. (?) Megard married Stella Larson, daughter of Ludwig Larson and Oliva Stone. Evelyn Larson was the daughter of Ludwig Larson and Oliva Stone. Evelyn Larson married (?) Sommervold. (?) Sommervold married Evelyn Larson, daughter of Ludwig Larson and Oliva Stone. Oswin Larson was the son of Ludwig Larson and Oliva Stone. Lars Myran married Esther Anderson. Married Name Her married name was Myran. Esther Anderson married Lars Myran. Married Name Her married name was Sorenson. Lyla Myran was the daughter of Lars Myran and Esther Anderson. Lyla Myran married (?) Sorenson. Lyla Myran died before 2013. (?) Sorenson married Lyla Myran, daughter of Lars Myran and Esther Anderson. Gordon Myran was the son of Lars Myran and Esther Anderson. Gordon Myran died before 2013. Norman Myran was the son of Lars Myran and Esther Anderson. Norman Myran died before 2013. James Zweifel was born after 1940. He was the son of Walter Zweifel and Laura Marie Myran. James Zweifel died before 2013. Rolland Wayne Amundson was born on 28 March 1932 at South Dakota. He was the son of Oscar Amundson and Pearl Anderson. Rolland Wayne Amundson died on 2 December 2012 at South Dakota at age 80 Rolland Wayne Amundson was born March 28, 1932 in Yankton, SD to Oscar and Pearl (Anderson) Amundson. He died December 2, 2012 in Sioux Falls at the age of 80 years, eight months and four days. Rolland was raised and attended school in several states as his father worked road construction. When he was 19 he joined the US Army and served in the Korean War. Upon his honorable discharge he married Beverly Murray April 16, 1960 in California. Rolland was a proud teamster truck driver for many years. Following his retirement at 62, he and Beverly spent several years crisscrossing America in their RV where they made lifelong friends. He enjoyed fishing, woodworking, traveling and spending time with his family. Rolland began playing golf in the past few years and was rewarded by getting a hole-in-one. Survivors include his wife, Beverly of Beresford; two daughters, Belinda (Jeff) Cornelius of Canton and Dixie (Tim) Herll of Mitchell; five grandchildren, Levi (Kim) Ernster, Derek Ernster, Quinci Herll, Austin Cornelius and Devin Cornelius; three great-grandchildren, Gavin, Bentlee and Hannah Ernster; two sisters, Shirley Mikkelson of Viborg and Carla (Duane) Hacecky of Irene; one sister-in-law, Eleanor (RL) Williamson of Georgetown, SC; two nephews and three nieces. Memorial services for Rolland are 7PM Wed. Dec. 5, 2012 at Wass Funeral Home in Beresford with the family present from 6-7PM. The family requests memorials to the charity of choosing. Roger McKellips was the son of EF McKellips and Amy (?). Roger McKellips married Wilma Linduski, daughter of Henry Linduski and Myrtle (?). Married Name Her married name was McKellips. Wilma Linduski was the daughter of Henry Linduski and Myrtle (?). Wilma Linduski married Roger McKellips, son of EF McKellips and Amy (?). Brian Sommervold died before 2013. Name Variation Kathryn Jean McKellips was also known as Kathy. Married Name 2 July 1966 As of 2 July 1966,her married name was Solberg. Kathryn Jean McKellips was born on 6 November 1946 at Lawrence, Douglas, Kansas. She was the daughter of Roger McKellips and Wilma Linduski. Kathryn Jean McKellips married Wendell Solberg, son of Oscar Solberg and Alice Moberg, on 2 July 1966 at South Dakota. Kathryn Jean McKellips died on 7 November 2012 at South Dakota at age 66 Kathryn Jean Solberg was born November 6, 1946 in Lawrence, Kansas to parents Roger and Wilma (Linduski) McKellips. She died November 7, 2012 at her home in Sioux Falls, SD. She was baptized and confirmed at the Alcester UCC by Pastor Paul Muiguel. Kathy graduated from Alcester High School in 1964 and attended Dakota Wesleyan in Mitchell, SD. She married Wendell Solberg July 2, 1966 in Alcester. Kathy worked as an insurance agent at the State Bank of Alcester for many years. Her family was the most beloved part of her life here on this earth. Her paternal grandparents, EF and Amy McKellips; maternal grandparents, Henry and Myrtle Linduski; special nephew, Brian Sommervold; special nephew-in-law, Matt Kleinhesselink and beloved aunt, Phyllis Purdy preceded her in death. She is survived by her husband, Wendell Solberg of Sioux Falls; daughter, Becky (Chris) Powell of Parker; two grandchildren, Austin and Amy; her parents, Roger and Wilma McKellips of Sioux Falls; two sisters, Sherry (Merlyn) Sommervold of Chancellor and Bev Livingston of Sioux Falls; brother, Gary (Deb) McKellips of Alcester; many nieces, nephews and cousins. Memorial services will be held 2PM Saturday, November 10, 2012 at Alcester United Church of Christ. The family will be present 6:30-7:30PM Friday at Wass Funeral Home in Alcester. The family requests memorials to the Alcester UCC. Wendell Solberg was born on 22 September 1946. He was the son of Oscar Solberg and Alice Moberg. Wendell Solberg married Kathryn Jean McKellips, daughter of Roger McKellips and Wilma Linduski, on 2 July 1966 at South Dakota. Wendell Solberg died on 21 October 2017 at age 71 Wendell D. Solberg, 71, of Alcester, SD, passed away Saturday, October 21, 2017 at Sanford USD Medical Center, Sioux Falls, SD. Funeral services will be 10:00 AM, Wednesday, October 25, at Alcester United Church of Christ. A prayer service will be held at the church at 7:00 PM on Tuesday, October 24 with visitation to follow until 8:00 PM. In lieu of flowers, please consider making a memorial donation to Alcester United Church of Christ. Wendell Solberg was born on September 22, 1946, and was adopted by Oscar & Alice (Moberg) Solberg. He was raised on a farm south of Alcester and attended country school and graduated from Alcester High School in 1964. He farmed with his dad until he enlisted in the Air Force in 1966. Wendell spent 1 year in the Philippines and 3 years in Rantoul, Illinois, receiving an honorable discharge in 1970. He married Kathy McKellips in Alcester on July 2, 1966. After leaving the service, they returned to Alcester where he farmed for a short time and where their daughter Becky was born. In 1980, Wendell began working at the State Bank of Alcester as a loan officer, and later in his career worked as a teller before retiring in 2015. They lived in several cities including Hawarden, Vermillion, Orange City and Alcester. He was a very devoted husband, father, and grandfather. He loved to go fishing, take care of his yard, and host backyard barbecues. He was a true optimist, who always had a smile and a joke, and was dearly loved by friends and family. He was a member of United Church of Christ, Alcester, where he ushered and mowed for the church, and did many volunteer jobs. Wendell was preceded in death by his parents, wife Kathy, and father-in-law Roger McKellips. He is survived by his daughter, Becky Kezar, and her husband, Bob, Mead, Colorado; two grandchildren Austin and Amy Powell; mother-in-law Wilma McKellips, Sioux Falls; sisters-in-law Sherran Sommervold and her husband, Merlyn, Chancellor, SD and Beverly Livingston, Sioux Falls; brother-in-law Gary McKellips and his wife, Deb, Alcester, SD. EF McKellips married Amy (?). Amy (?) married EF McKellips.